For the last 16 years, these two bears were forced to spend their lives in cages alone, without one another's companionship to lessen their misery. But now that they've been rescued, everything has begun to change for the better. They finally have each other - and you'll soon see that they couldn't be happier. Milcho and Gosho were born at a bear "prison" of sorts in Bulgaria, where they were bred for the sole purpose of being shot in canned hunts. There, they were denied even the most basic semblance of a natural life, but were rather kept in solitary confinement behind bars, awaiting their turn to die. It is believed that they never had contact with another bear. 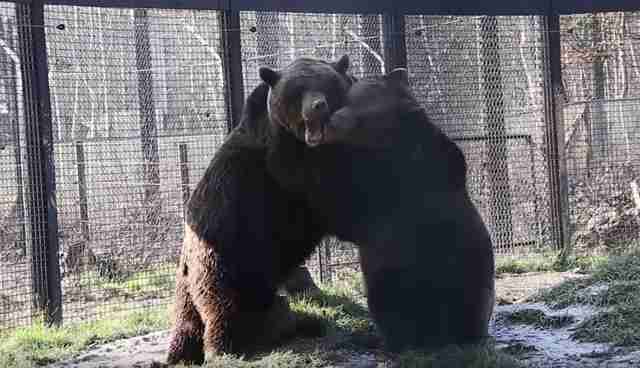 For more than a decade and a half, the two brown bears languished there in isolation. Hope came, however, after new laws against breeding bears went into effect. The bears' owners abandoned them, and nearly all the bears were moved off to better lives. Milcho and Gosho were the last two who remained. Last year, experts from the Wildwood Trust stepped in to help them. They loaded Milcho and Gosho in a truck and drove the long journey back to the bears' new home at the trust's sanctuary in Kent, England. Though they were free of the dark cells that had held them for so many years, the bears' physical and mental health was still fragile after their lifelong ordeal. For that reason, rescuers initially kept them apart for their own safety - but no longer. This week, Milcho and Gosho were introduced, and their meeting was breathtaking. For the first time, they weren't alone. "After enduring lives of terrible neglect and suffering, the bears have required many months of costly care and rehabilitation to bring them back to full physical health," wrote the Wildwood Trust. "The bears can now enjoy the company of each other and this is a significant step to their full mental recuperation." Milcho and Gosho will now spend their days readjusting to life, learning what it means to be a bear. But while they will likely never be truly free and wild, there must be no greater feeling of liberation than to finally have a friend.